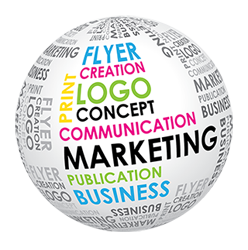 Because logos are the symbol and design to identify a company's products and services, it's the pivotal piece of a company's branding and image; therefore, let our team of designers assist in this process. Contact our team today for a free consultation and see what we can do for you! Brochures are versatile and informative printed marketing kits that help promote your business or product(s). Let our team design your brochure. Business cards are still an effective way to swap contact information and leave impression of your brand. Let our team design your business card. Whatever your need is, we have a solution for that. Let us know how we can help you today! Social media is an inexpensive and great way to market your business and services. We have a team that can create your business an account, assist you in using your account, and perform graphic design to give that account a great look! Call today and let our team help with your social media needs. Whether it be a new website, redesign of an existing website, or updates to a website, our team can make your ideas a reality. We have skilled designers that take pride in their work to provide you with a custom solution that's right for you. Contact us today and find out what we can do for you!